Avita Medical chief executive Dr Michael Perry. Dr Michael Perry’s career has been broken into “a third, a third and a third” – big pharma, small biotech companies and eight years with San Francisco venture capital firm Bay City Capital. That’s the mix of skills he will bring to the top job at Avita Medical (ASX:AVH), the company trying to commercialise spray-on skin technology famously used to treat victims of the 2002 Bali bombings. The technology, now called ReCell, was developed by former Australian of the Year Fiona Woods and has had plenty of media coverage but has yet to be fully embraced by the medical community. Avita has been struggling to make progress on that mission for many years, and now appears to have put everything on the table in its bid to break into the US – including the option of packing up and moving there if need be. That’s why the most important thing about Dr Perry isn’t just his background, but where he lives. Dr Perry, based in Valencia, California, was appointed CEO of Avita in June after its board decided to bet heavily on breaking into the US market to try to turn the company’s fortunes around, sacrificing its previous CEO Adam Kelliher in the process. The board said its new strategy hinged upon having a chief executive based in the US. Mr Kelliher, based in London, opted not to move overseas and so resigned. Dr Perry has since flagged to shareholders that he is going to review whether to move the company’s operations to the US. In an interview with Stockhead, Dr Perry said his top priority as incoming CEO was to complete and submit an application to the US FDA for approval to use ReCell with patients with severe burns – and he intended to do it this quarter. “The US is by far the largest healthcare market globally,” he said. In its bid to enter the US market, Avita is being helped by a US government department you should pray you never to have to deal with – BARDA, or the Biomedical Advanced Research and Development Authority. Its job is to prepare for the worst. We’re not saying BARDA deals with zombies but, you know, they probably would. “They sit under the same structure as the US FDA, which is the Department of Health and Human Services,” Dr Perry said. Those potential disasters include nuclear attacks and biological weapons, as well as outbreaks of diseases. BARDA has put its weight behind Avita in two critical ways. First, it has pledged to buy an initial order of “approximately US$8 million worth of ReCell devices to be stockpiled in the case of a mass casualty event in the US”. But even more importantly, it has put its money behind robust clinical trials of the device which the company hopes will be key to both securing FDA approval and convincing conservative doctors to embrace the new-ish technology with irrefutable evidence of its benefits. Economic modelling, paid for by BARDA, that shows burns patients treated with ReCell recover faster and spend 40 per cent less time in hospital is due in the next few weeks. “The initial glimpse into what the model is showing is that for a patient specifically with severe burns, not only are we getting a better outcome for the patient but we’re also saving the healthcare system and the hospital money at the same time,” Dr Perry said. A slide showing how ReCell works from Avita’s June 2017 presentation. ReCell is a small device – “probably the size of two fists put together” – that produces a spray-on skin material called a Regenerative Epithelial Suspension from a piece of real skin. 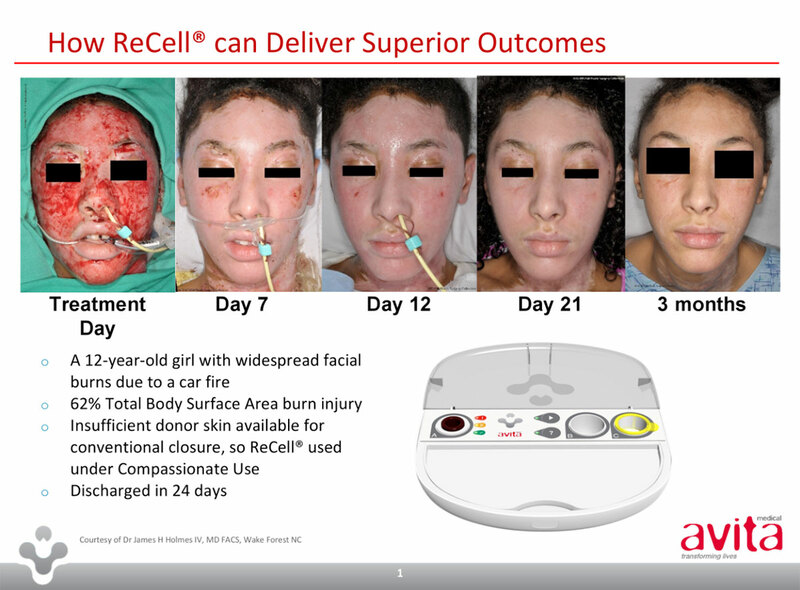 “What we do with ReCell is we take a normal area of skin, put it into the device at the patient’s bedside and within 30 minutes we end up with a version of spray-on skin,” Dr Perry said. Normally, patients with severe burns or wounds have to wait for skin to regrow from the edges inwards, which Dr Perry refers to as the ‘free edge’ effect. The options to overcome it are skin grafts and ReCell, or both together. “ReCell takes that ‘free edge’ effect, and allows us to remove that limitation by spraying these disaggregated cells across the entire surface area of the wound,” Dr Perry said. The devices are single-use only, and produce a limited amount of material. A patient with burns to 70 per cent of their body may require up to three ReCells to cover the area. Avita’s shares have traded between 7c and 14c over the past 12 months. The company spent $2.51 million in the June quarter, leaving $3.79 million in cash held. It expects to spend another $3.97 million in the current quarter, which may be offset by incoming money from BARDA and existing customers.